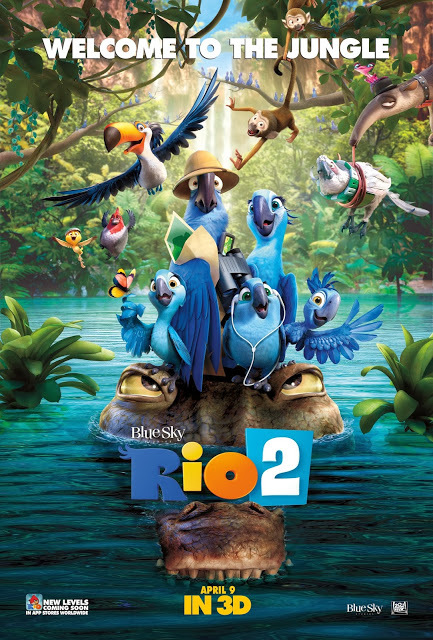 The first “Rio” was a huge hit and one of my favorite animated movies of 2011. But even animation isn’t immune to the greed that drives Hollywood studios nowadays. That’s how an imaginative feature has managed to spawn a pointless sequel. The first film had everything going for it: an ingenious storyline, an unusual setting, and cleverly designed characters with excellent voice work. The original voice cast, led by Jesse Eisenberg is still having a good time here but the results bear little resemblance to their entertaining first film. The movie picks up where the last one left off, with Blue and his family enjoying life in beautiful Rio. But they soon end up in the Amazon, searching for fellow members of their species and trying to reconnect with their roots. Once there, they meet Jewel’s long-lost father Eduardo (Andy Garcia) and uncover an evil plot to rip down the forest. Visually, the movie is stunning. But unlike its predecessor, which followed a straightforward path, this sequel is incredibly cluttered. Director Carlos Saldanha seems intent on packing his film with fast-paced gags and plenty of new characters, but he has lost sight of the bigger picture. Sometimes simple is better. At least, I tend to think so. The people behind this unnecessary movie clearly disagree.